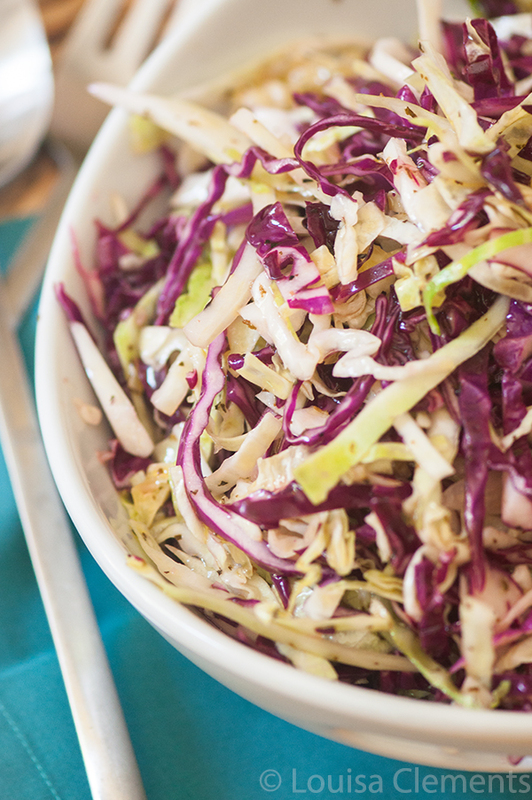 Inspired by the flavours of Italy, this coleslaw with Italian dressing is a simple twist on a classic salad, perfect for a summer cookout. I often eat a bowl of this coleslaw with Italian dressing for dinner and lunch. It’s that good. I’ve always been a huge fan of coleslaw, and I got the idea for this recipe last year around Christmas time. Yes, this recipe has been a long time coming. You see, a guest of the TV show I was working on had this amazing Italian lunch catered for us as a Christmas gift. Part of the meal was a sweet, tangy and delicious coleslaw with a basil dressing, and I knew right away that I had to recreate it. That conversation has really stuck with me, because I’m starting to realize that these slightly over-achieving tendencies I have might just be my “fatal flaw”, as they call it. I’ve always been the type to put a lot of pressure on myself to succeed (whatever that means) because I want to do better. Be better. For as long as I can remember (which granted, at 21 isn’t that long) I’ve always believed that no matter who you are or what you’re doing there is room for improvement and progress. I think this stems from being a competitive figure skater when I was a kid, no matter what you were doing, it could always be better. It’s the same now, I can always get higher grades, post more recipes, and take better photos, be a better friend, a better sister, and a better daughter. But the minute that something goes wrong, maybe there’s a fight or it’s something as minute as a month with slow traffic, I get frustrated and down on myself for not living up to my own expectations. It’s so silly really, when you think (or write) about it. I think the issue is that when we actually accomplish something we just check it off, like it’s no big deal, but when we don’t accomplish something, we wallow in it. I guess it comes down to regret maybe? How could we have done it better? If we could go back, what would we say? What would we change? Anyways, I’m sure that I haven’t figured out anything with this post but maybe I’m not alone in all of this – thank you for indulging my rambling. Would love to hear your thoughts on all of this goal setting & ambition business in the comments! Are you an “achiever”? Do you relate to this in any way? And as always, a recipe for you to make this weekend. Coleslaw with Italian dressing is a fun Italian twist on an American/Canadian classic. Inspired by Italian flavours, this coleslaw is tossed with a delicious basil dressing. An Italian twist on an American classic! In a saucepan, bring olive oil, cider vinegar, sugar, garlic, basil, salt and pepper to a boil. Boil for 30 seconds and remove from heart. Allow dressing to cool before pouring over cabbage. I have that same mindset in just about everything. --- I think it's because we strive so hard to be perfect in everything, but in reality we CAN'T succeed and accomplish everything we want in life. Really thought-provoking when you think about it....And this coleslaw looks perfect! I love a good classic coleslaw and am loving how you topped this with an Italian dressing rather than the usual mayo dressing. Superb photos too! The lighting is just perfect! Thanks for the kind words, Sarah. I love that this post made you think a bit more about all of this, I find it so fascinating and love hearing the thoughts and experiences of others. Hey Lou! I love coleslaw in the summer. I could honestly eat a truckload of it at every meal!I hear you about the always room for improvement thing. Although, you're so young! I'm turning 27 in a couple of months and I'm up to my eyeballs in things I want to do, improve on, try, etc. There are always things I want to achieve, but I'm trying to make a better effort at enjoying the process along the way. :)PS. Your photos are gorgeous! I have been having so much coleslaw lately, and I love it! So in the back of my mind I am trying to think of loads of ways to give the recipe twists, this sounds perfect, Lou! Great alternative to the ol' mayo/cream dressing. Thank you, Mariana! 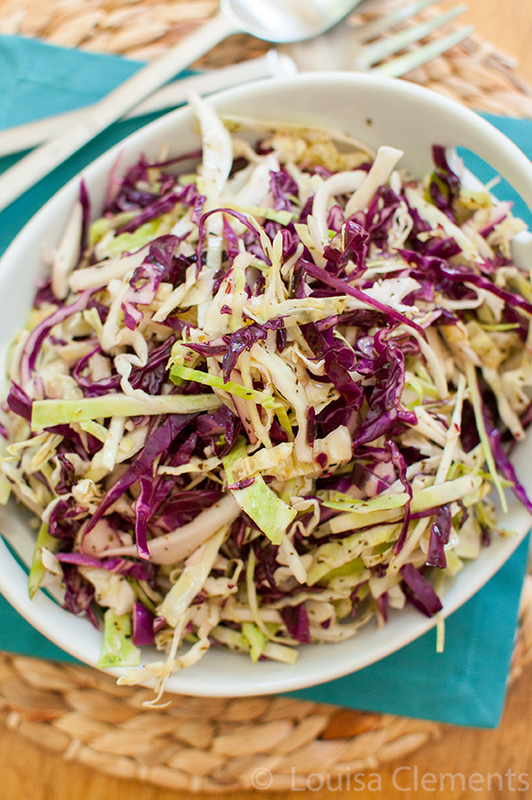 I've been so into coleslaw also, they are just perfect for summer! HI, Lou! I think this is a VERY common problem indeed. I'm almost (not quite!!) twice your age but I do still put a lot of pressure on myself to achieve and get disappointed easily if, for example, I didn't tick all the things off my 'to-do' list in a particular day. I think what I've learnt over the years, though (and TRY to remember) is that you can only do your best, and that is always good enough. P.S. The coleslaw looks so healthy ... and tasty too with that lovely simple dressing. It's nice to see a coleslaw that isn't smothered in mayonnaise!